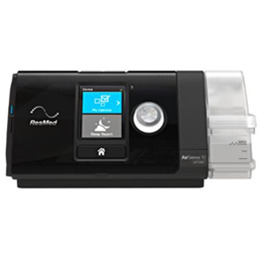 Rest easy in your pressure therapy with the AirSense™ 10 AutoSet™, an auto-adjusting system that can differentiate between different apneas and detect Cheyne-Stokes respiration and adapt accordingly. With an integrated humidifier, wireless communications, and an optional pulse oximetry monitor, the AirSense™ 10 AutoSet™ delivers low pressure as the wearer falls asleep before ramping up to its prescribed pressure level. A built-in light sensor adjusts its brightness display depending on level of light in the room, turning itself off when not needed. The device also connects to ResMed's AirView™ software remotely to read and track nightly therapy data.